I saw a post in my build where someone said Insta-Rust or something. Also using red & brown powered pigments and chalks is supposed to work good. If you hit on something fool-proof, (Or idiot-proof! ), let me in on it. I'm going to start with an old looking painted surface and add rust. I'll try acrylics first, if it doen't work I can remove it. I am seeing your vision here and looking forward to the result. Lay on the pastels, after grinding some off as powder using sandpaper, in different shades. Do some blending with an old soft brush etc etc but give yourself a bit of contrast so that when the clear coat goes on it does not all disappear. After a dull coat to seal in the initial colours you can then top up with more pastels if yoiu feel the need. You can also mix with white glue to give caked on mud effect as well. Just an alternative that is quite cheap and easy to do. It really is just pigments like Mig/AK but cheaper. This sounds interesting. I'm not one to go covering the model I worked hard on with lots of goo so I'm not much into weathering. This will be a stretch of my skills. Once I get the rust right I will apply some light colored dust to make the truck look like its been down some gravel roads. I've ordered some Rust n Dust from MicroMark. It seems like a simple dry way to age models as much as you want but not to much. I'll keep you appraised after I get it and try it out. 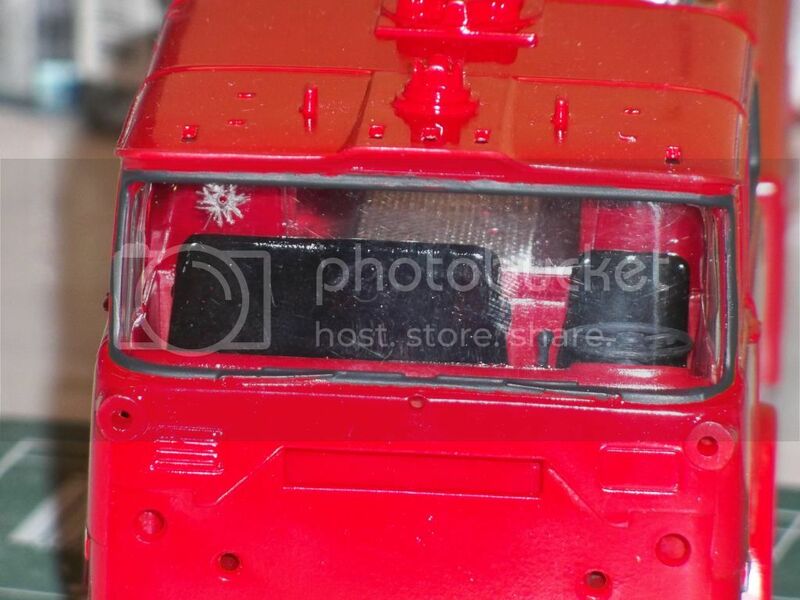 A couple of pics, its starting to look like a fire truck. Some cracked glass on the side windows. A bullet hole in the windshield. Time to start making some rusty half painted steel panels. Oh that's just gob smacking good so far. Is this the point where you get a little crazy...er with the build? Crazy can happen at any time. I do take my pills everyday, just like the judge told me to. I'm having a little trouble deciding what to do with the lights, horns and sirens on top of the cab. Pretty sure the sirens will go. Can't take a chance on hitting the switch by accident and attracting every zombie for miles around. Most of the lights will stay. Next will be the ultimate zombie plow! Does anyone know of a good description of how to use salt as a random mask over rust colored paint? I've heard of other people using it and I just need to make sure I'm doing it right. I was reading about this just the other day. It said spray a light dusting of cheap hair spray over the area like a light mist. This holds the salt in place during the painting. Then sprinkle the salt on lightly. They recommended the big grain Kosher Sea Salt for the bigger spots where rust had gotten in under the paint. Let it dry well then you spray the over coating of paint over that and let it dry and gas out. Then you use a soft tooth brush and gently brush the salt off OR use a toothpick, (Do these guys have stock in dental hygiene companies? ) or sharp pointed hobby knife to 'flick' the salt loose. I have never tried it but I might, along with the rubber cement under the final paint so you can get places the paint had 'peeled' off the under paint or primer. I haven't tried either of these techniques but they look good from what i saw. 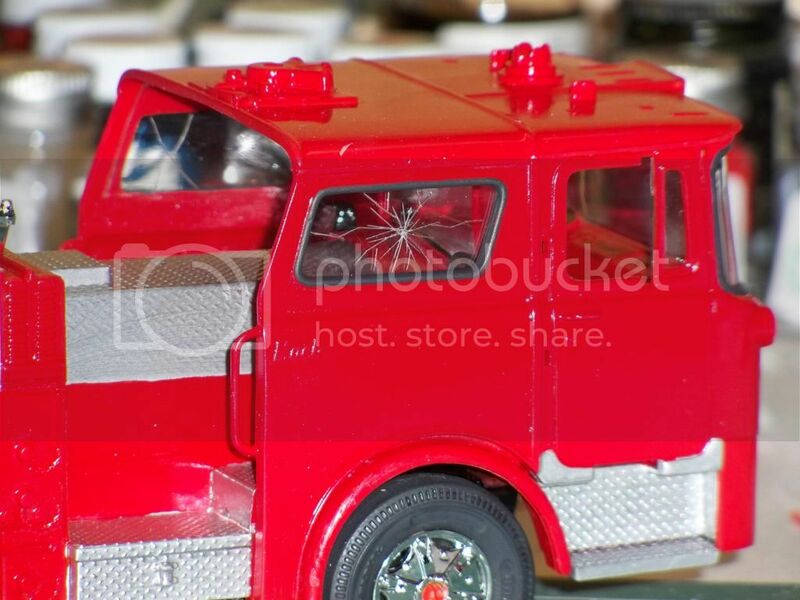 I've never tried that scale before, but I do have a Corgi all metal 'Airport Fire Tender' 6 wheeler. Which has seen better days, I rescued it from my nephew. Thanks for the idea. Thanks for the info on salt. I was under the impression that water was used instead of hair spray but, hey, why not? I want to make some of the panels look like they had benn painted once a long time ago and had rusted through. Also any spot that had been welded would be rusty.I had better work on this rust technique as it will cover alot of this model. I always was told salt melted in water. When the water evaporated the salt would be left behind. Hopefully in the places you wanted it to be.